Want even more great style and exclusive benefits? 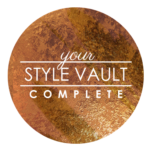 Experience Your Style Vault Complete. All-access to shop additional categories from all our fabulous contributors in shoes, handbags, jewelry, skincare, beauty, hair, and more.